Every category has its own metadata scheme. In other words: all folders within one category will use the same metadata scheme. This will help saving time as we can copy and reuse the metadata. The name of the yoda-metadata.xml is configurable by the administrator, for instance you could use the same name as the corresponding xsd file e.g. i-lab-metadata.xml. Let’s say we add metadata to folder B. The fields with a red padlock in front of it are mandatory. In this example, we fill in “B” in every mandatory field and save. The green checkmarks indicate all mandatory fields are filled. This will result in a yoda-metadat.xml file in folder B. 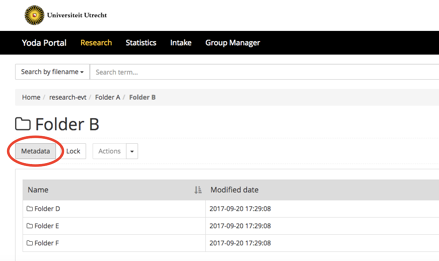 Opening the metadata for folder H in Yoda will show that all the fields that you filled in for folder B are filled here with the same information. You only have to adapt those fields that are different for folder H.
Another possibility is editing the information in the yoda-metadata.xml file and then saving it in Folder H.
In the portal you will find a button to clone the metadata from the parent folder to your Folder. This button is positioned in the right bottom corner. After cloning you can make changes to the metadata to adapt the data to your folder.